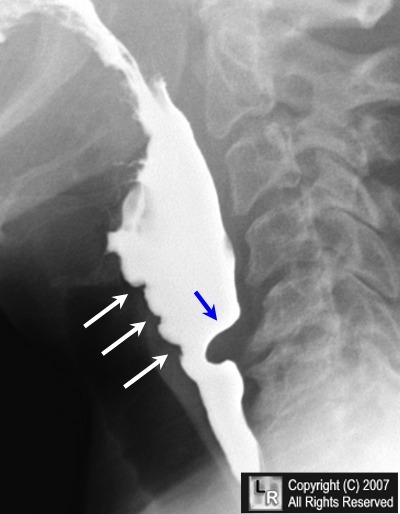 Others who demonstrate a prominent cricopharyngeus on barium swallow may complain of dysphagia or a "lump in the throat"
Prominent cricopharyngeus muscle. The blue arrow points to a posterior, bar-like protrusion at the level of C5-C6 that represents a prominent cricopharyngeus muscle. 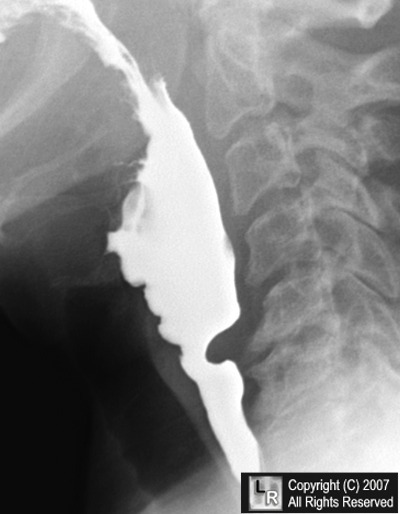 Usually relaxed on swallowing in asymptomatic individuals, the cricopharyngeus is not visible on a normal barium swallow. The white arrows point to disordered tertiary waves of contraction.